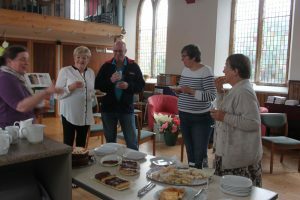 For the past fourteen years Janet Dypevaag has been working in the Centre office, keeping an eye on bookings, finances and all the practical day-to-day matters that everyone depends on. 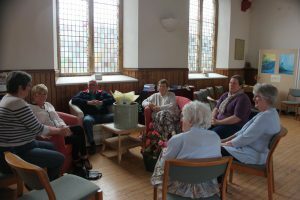 Lots of people who use the Centre will have spoken to Janet on the phone, though not nearly so many will ever have met her in person. But everyone knows what a central part she has played in the development and continuation of the ministry here. But now Janet has decided that the time has come to retire. 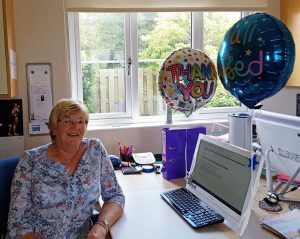 Her last working day at the end of July was marked by balloons at the computer and some sincere words of thanks, but a couple of weeks later there was opportunity for those thanks to be expressed in more tangible ways. 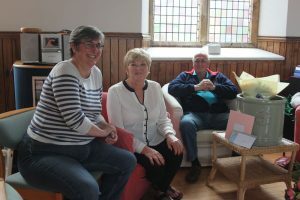 A small group of friends held a tea party at the Centre for Janet and Billy at which Rachel Poolman our Warden spoke of her own personal appreciation for Janet’s work over the years, and Sheila Flett and John Durell, who have both represented the Synod, shared some of their memories of working with Janet. 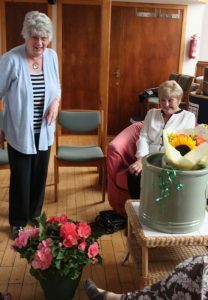 And between them they presented a variety of tokens, as well as flowers and gardening equipment, which we all hope Janet will now find time to spend and to enjoy.